I’ve been a keen photographer for many years, but until recently I had never had any success in photographing lightning. I also very rarely see lightning storms, so I hadn’t had much opportunity. Recently though, a storm was floating around Lyme Bay that I managed to capture. I thought I might share a few tips with you to help you capture some lightning for yourself. There are a number of different types of lightning, but fork lightning is the most impressive to photograph. Sheet lightning will light up your whole surroundings but in a photo it is likely to just look like a stormy day, even in the middle of the night. The first, and probably key tip is to use a tripod. It will not be possible to capture fork lightning without a tripod because everything will blur. Generally, the slower the shutter speed you can use the better, because the longer the shutter is open, the more chance you have of capturing that split second in an image, but without the tripod you will not be able to avoid camera shake. The next job is to compose the image. To ensure the best chance of getting lightning in the composition, use a wide angle lens, ideally include a landmark or some land in the image to add interest to the composition. Make sure that the camera is pointing in the most likely direction to see some lightning, and ensure there is plenty of sky visible in the viewfinder too. Next, you need to work out the exposure and aperture settings. You can either use manual mode, or try using the Tv setting. Make sure also that the camera is capturing in RAW format, as this gives you the flexibility to tweak the exposure retrospectively on the computer. At this stage, we need to fire a few test shots. By using a slower shutter speed you can ensure there’s more chance of capturing the lightning. The image I’ve included in this post was 13 seconds at ƒ3.5. I captured images in succession; as soon as one shot was taken, I released the shutter again, using a remote release to prevent movement in the camera. It is time consuming, and efforts can be fruitless, but with patience, a few good thunderstorms and these tips you should be able to capture some lightning on camera. 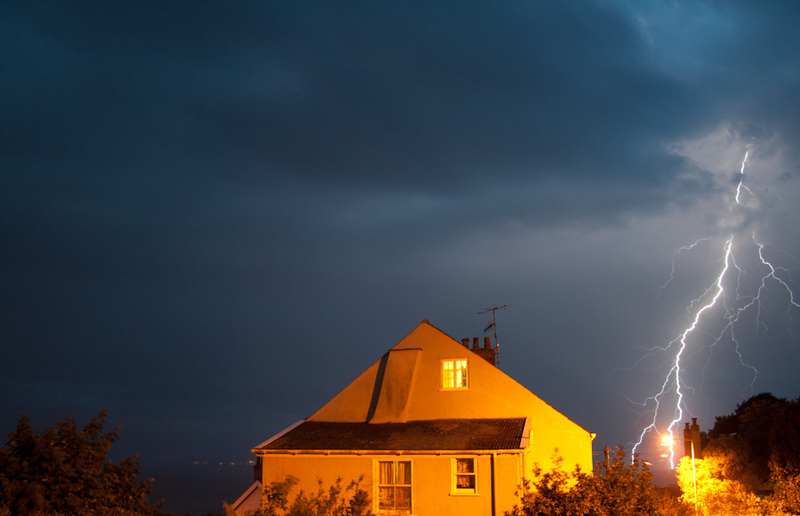 Beautiful photo…love the dark, gloomy sky, the lightning and the illuminated house. That is a great first submission to the weekly photo challenge. And the info on photography is great, I think I need to get into photography. I have 2,500 photos from my recent trip to peru but they are all just, “hey look this is what I am doing/eating shots.” I am photography buffoon. But Life is learning. It’s more or less how I got into photography, I used to just try and take pictures of places I’d been because I knew my memory was bad, and thought that photos would be a good way to remember. I then went on to do A Level photography, but it’s still only a hobby at the moment.